Humayun's Tomb Complex, New Delhi, India. 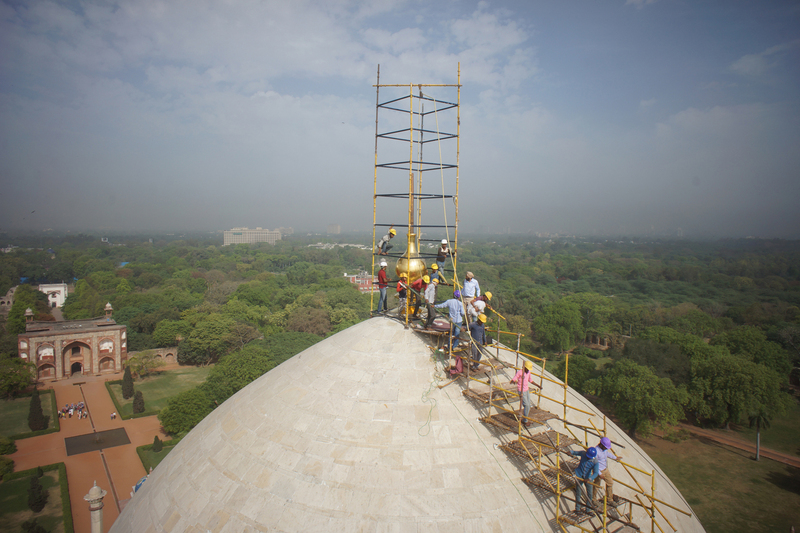 Installation of Humayun’s Tomb’s finial in New Delhi, India. Humayun's Tomb and Garden Complex is a UNESCO World Heritage Site and the inspiration for the Taj Mahal. The Aga Khan Trust for Culture (AKTC) has immensely contributed to cultural restoration of monuments in India. Since 2007, the Initiative has led over 30 monuments being conserved, almost 150 acres sensitively landscaped, over 2,000 individual craftsmen employed and over 20,000 trees planted. Humayun's Tomb Complex, West Gate, New Delhi, India. 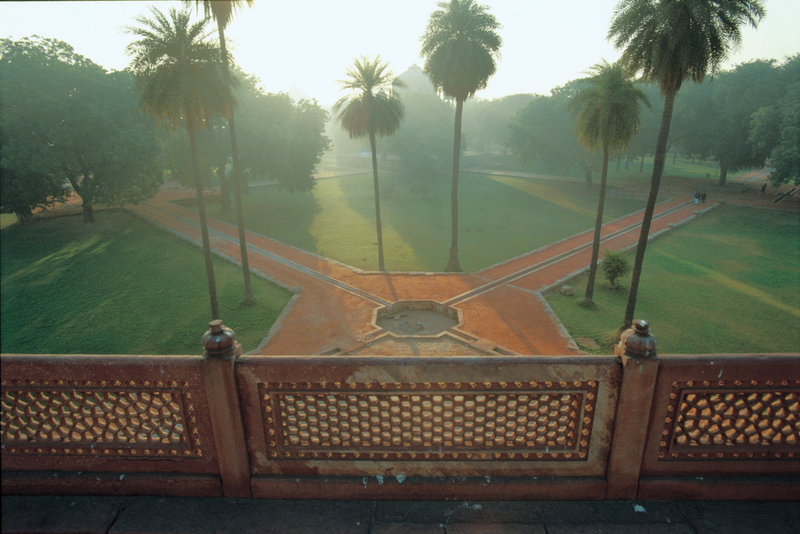 Humayun's Tomb Complex, view over garden and pathways from Tomb terrace, New Delhi, India. 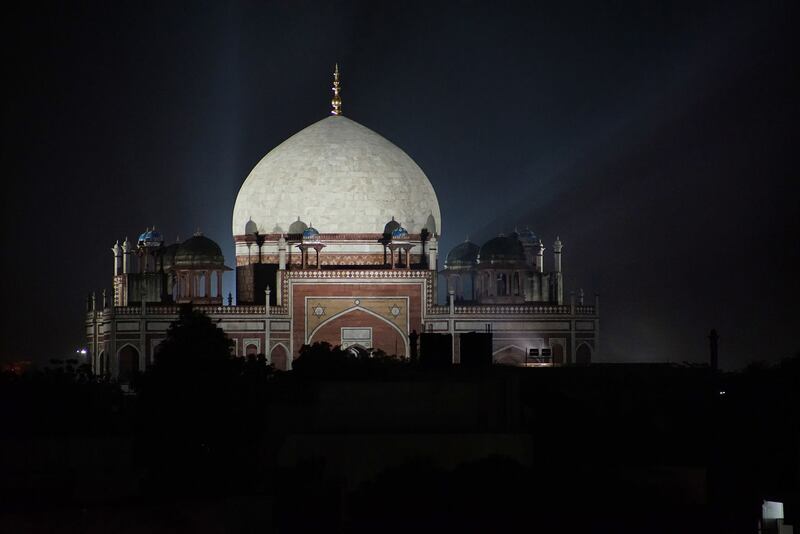 The illuminated white marble dome of Humayun’s Tomb, New Delhi, India. Humayun's Tomb Complex, facade detail, New Delhi, India. Conservation works undertaken on the mausoleum of the Mughal emperor and associated buildings were based on exhaustive archival research and the highest standards of documentation. The plan was implemented by master craftsmen using traditional tools, craft techniques and building materials. Significant conservation works that had been undertaken included the careful removal of over one million kilos of twentieth century concrete from the roof and major repairs to the dome. Restoration of the stone paving on the lower plinth required the manual lifting of 12,000 square meters of stone blocks, most weighing over 1,000 kilos. Regular training programmes and workshops for conservation professionals and craftsmen from across India were held. Sunder Nursery, New Delhi, India. The 90-acre Sunder Nursery stands on the Mughal-era Grand Trunk Road. It is home to several monuments of national importance. As with the Humayun’s Tomb conservation, works were preceded by the preparation of a detailed Conservation Plan. Principal works undertaken included ongoing conservation of the unique sixteenth century Sundarwala Mahal to reconstruct recently collapsed portions and the restoration of the unprotected eighteenth century Mughal-era garden pavilion. Sundarwala Burj, Lakkarwala Burj and Azimganj Serai also require conservation works, which are now completed. Chausath Khamba, Nizamuddin Basti, New Delhi, India. The conservation of monuments and the rehabilitation of open spaces in the Basti aim to restore its intrinsic cultural, historical and spiritual significance. Conservation works commenced following the partial collapse of the fourteenth century baoli (step-well). Conservation works benefited from the use of state-of-art technology, including Ground Penetrating Radar Survey, High Definition 3D laser scans and geotechnical assessments. The collapsed portions were rebuilt as per the original construction techniques. Prior to conservation works, a dwelling unit over the collapsed portion needed to be dismantled and alternate accommodation built for the family. In keeping with the requests of the local community, seven centuries of accumulations were manually removed from the baoli. At the eastern edge of the Basti stand two important tombs: the unique and striking Mughal tomb known as Chausath Khamba and the tomb of Mirza Ghalib, South Asia’s most renowned poet. Together, they form one of the largest open spaces in the Basti. Landscape works at Ghalib’s tomb have enhanced the historic character and restored dignity to his resting place. The serene and tranquil courtyard, separated from the street by stone lattice screens, will now serve as an ideal locale for mushairas. Jardins do Túmulo de Humayun após a reabilitação. Main water channel and pool after restoration. The city of Delhi holds some of the most important sites and monuments from the Mughal period - among them Humayun’s Tomb and Gardens, now part of a densely built residential district of the Indian capital. On the occasion of the 50th anniversary of Indian independance, AKTC decided to sponsor the restoration of Humayun’s Tomb Gardens - a four-part paradise garden (chahâr-bâgh), where the gardens are divided into quarters by raised causeways. The quadrants are divided, in turn, into eight plots, each with walkways. At the intersection of these walkways are octagonal or rectangular pools. They represent the earliest existing example of the Mughal garden tomb and an important public open space. This first privately funded restoration of a World Heritage Site in India was completed in March 2003 through the joint efforts of the Aga Khan Trust for Culture (AKTC) and the Archaeological Survey of India (ASI), under the aegis of the National Culture Fund. The objective of the project was to restore the gardens, pathways, fountains and water channels surrounding Humayun’s Tomb according to the original plans of the builders. The preservation of historic elements required archival and archaeological research, as well as close attention to the living and renewable landscape elements. Site works encompassed a variety of disciplines, including archaeological excavation, the application of conservation science and hydraulic engineering. The restoration project included the following main elements: reinstating the walkways and conserving the edging stones, repair, extension and reactivation of the irrigation system, establishing water sources for the water channels and irrigation system, including a pump station for a water-recycling system, conserving, repairing and rebuilding the water channel system, re-leveling the planted zones and revitalising them with species and arrangements that conform to the customs and patterns of Mughal sources. These activities were backed up with support for research that informs the conservation and restoration process, contributes to the development of educational materials for use in schools of architecture, conservation and heritage management, as well as for visitors to the Tomb. As part of the implementation process, a Management Plan was established to ensure proper long-term maintenance. 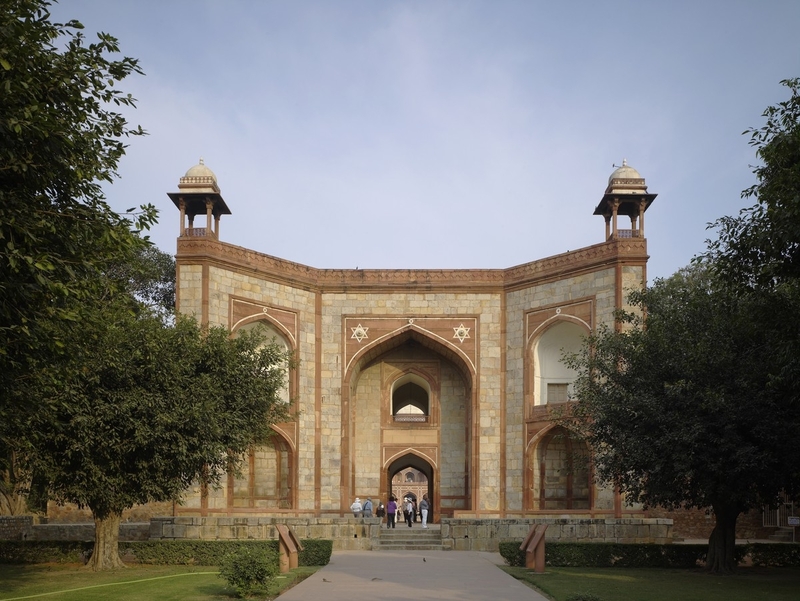 The completed restoration of Humayun’s Tomb Gardens returns a significant amount of enhanced green space to the city and the surrounding community, with its constituent parts returned to their historically authentic format. The project is expected to increase interest in and visitation to the Tomb, the Gardens and the associated visitor facilities (including parking), which together form a large complex next to a major urban highway in Delhi. In serving the local residents of Nizamuddin district as a community green area on one level, and the population of Greater Delhi as well as tourists on another level, Humayun’s Tomb and Gardens has rekindled interest in the rich history of Mughal rule.